I have not seen either of these two books but their origins are interesting. Sgt. Robert Hill was in the middle of the desert two years ago, teaching soldiers in Kuwait about the dangers of chemical attacks. He was an aspiring children's author, who wrote several books while off duty in the desert. Hill's hard work and dedication is paying off. "Where Do Sea Creatures Sleep?" has been published. Hill wrote several books in his off-duty time while he was there. He said the idea for the book came to him when his commander challenged soldiers to not to waste their time in the desert. 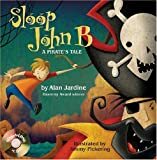 Al Jardine, one of the original Beach Boys, has written additional lyrics for their hit, "Sloop John B" and the result is a new chidren's book, "Sloop John B: A Pirate's Tale. "It's perfect for kids," said singer-guitarist Jardine, who split from the Beach Boys in 1998. "And the theme of the ocean is something I've always felt very strongly about."